Best Thank you Card Ever! 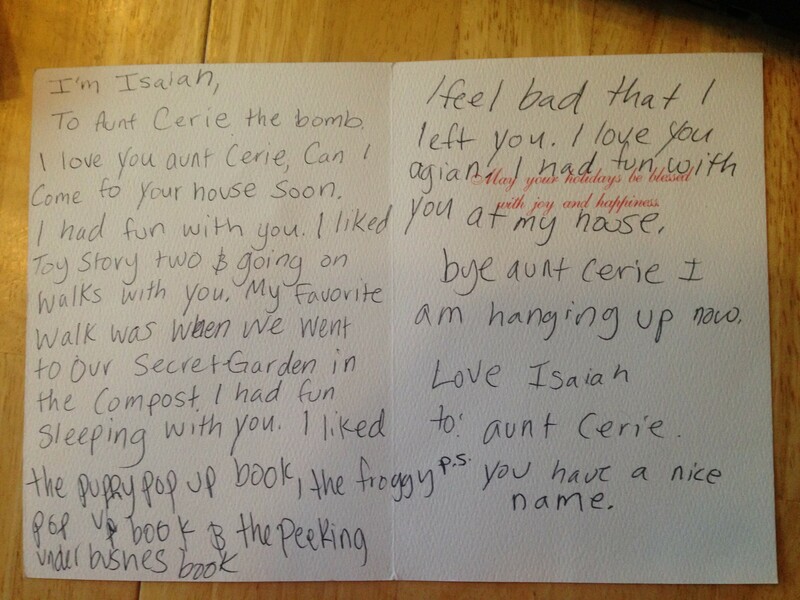 To Aunt Cerie the bomb. I love you Aunt Cerie. Can I come to your house soon. I had fun with you. I liked Toy Story two and going on walks with you. My favorite walk was when we went to our Secret Garden in the compost. I had fun sleeping with you. I liked the puppy pop up book, the froggy pop up book and the peeking under the bushes book. I feel bad that I left you. I love you again. I had fun with you at my house. bye Aunt Cerie I am hanging up now. PS You have a nice name. This entry was tagged children, family, inspirational, love, nephew, Thank-you. Bookmark the permalink.